Today, I visited the Massachusetts Archives out by the JFK Library. I had been to the JFK library before, but never to the Archives. I'll definitely be going back — the reading room is crammed with probate records, vital statistics records, and loads of other useful resources. I was there to see the probate records pertaining to Robert Cuming of Concord, MA. He died in 1754, leaving his entire estate to his wife, Helen, who later divided it among their three grown children, John, Ame, and Elizabeth. John graduated from Harvard, became a respected doctor, and earned the honorific "Colonel" for his service on the Committee of Correspondence during the Revolution. Ame and Elizabeth became shopkeepers in Boston, where they refused to abide by the nonimportation agreements. Eventually, they fled to Canada and were charged with treason in absentia. Oh, to be a fly on the wall at family gatherings. When I was finished in the reading room, I stopped by the Commonwealth Museum, which is really just a timeline of Massachusetts history aimed at students in grades 4-8. The displays are eye-catching and there are several interactive features, but practically no artifacts. What display cases there are are filled with reproductions of documents, playing cards, quill pens, etc. Since it is an archive, this is obviously a document-heavy collection, but even I, a lover of material culture, was very impressed. 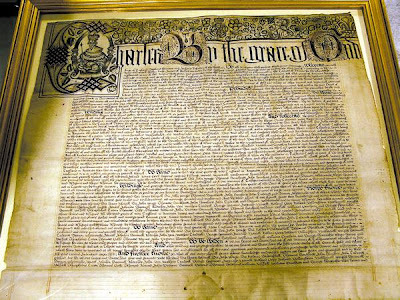 The 1629 charter (pictured above) looks so strangely medieval, and it's always fun to read the original Bill of Rights, in which our First Amendment is really #3. I didn’t realize the Cumings sisters had local relatives. Hmmm. I've been having a lot of trouble tracking down the Cuming sisters' origins. The probate records I saw yesterday were a big breakthrough — there's a note dated 1753 in Middlesex Probate file #5439 that's signed by Ame, Elizabeth, and John Cuming. The note is attached to Robert Cumings' will and indicates that his three children were satisfied with the terms of the will. I compared the signatures to the signatures in the James Murray Robbins papers at the MHS, and am 99% sure that they match. There were two other children, Robert (b. 1724) and James (b. 1726), but they did not sign the note. Robert may have been dead, but James may have been living in London. A 1769 letter from Elizabeth Cuming to Elizabeth Murray mentions that the sisters have a brother, James, living in London.